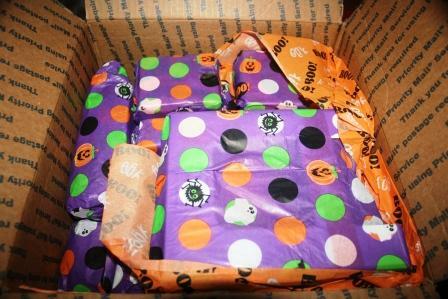 Two Bears Farm and the Three Cubs: Halloween Swap! The blocks sure are cute! The candy would be gone at my house too. The Great Pumpkin was good to you this year. How much fun that was! Fun! I'm sure the chocolate would disappear quickly in my house, too! I agree the blocks are so cute! This is a great idea!! How fun! So cute :) I want to a swap like this...love getting "snail mail"!! What an awesome package! :) Mmmm candy! 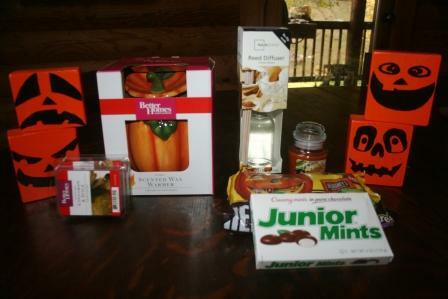 Those blocks are adorable, and the other stuff - especially the pumpkin tart warmer are awesome. That is the cutest tart warmer, ever! I love all things that smell of fall, spices and pumpkins. A beautiful and fun season indeed. Those blocks are really, really cute! And the candy would be gone here too. What a fun box of goodies you got! Nice...I would have eaten the candy first too! Hugs! Wow, it always amazes me that bloggers are so generous and give even more than they have to. What a great package! I guess I need to post some of my fall decorations, that had totally slipped my mind! And those blocks are adorable. What a great decoration idea. Clearly she is a *crafty lady*. you got a wonderful package!! i will visit katie!! That is a great swap package! I love those blocks, those are so fun!!! Those blocks are so cool! Adds a little fun to Halloween!